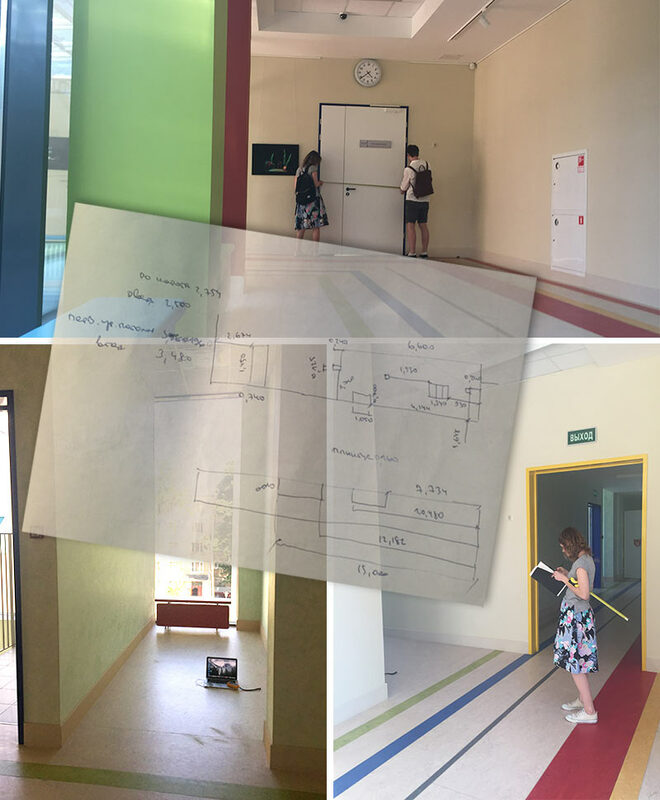 The client asks to create a library in one of the school’s hallways. Measuring all the elements and nooks to make sure we use correct dimensions when sketching. Later the measurements will also come in handy for planning shelves. Going to measure existing shelves and various children’s books in bookstores. Going through all the stages from sketches to 3D models. We’ve got loads of ideas but decide to go with something homely, establishing the connections «home—book,» «coziness—book.» Showing to the client, discussing, making corrections. Ultimately producing a sketch with small houses for reading books surrounded by shelf elements. Placing the reading room and librarians’ desks in the alcove while arranging the library itself along two walls. The nooks become secluded reading spots and places for reading with parents for kindergartners. The art director asks to add a matching structure on the opposing wall. The artistic director decides to make it out of horizontal houses that become soft poufs. 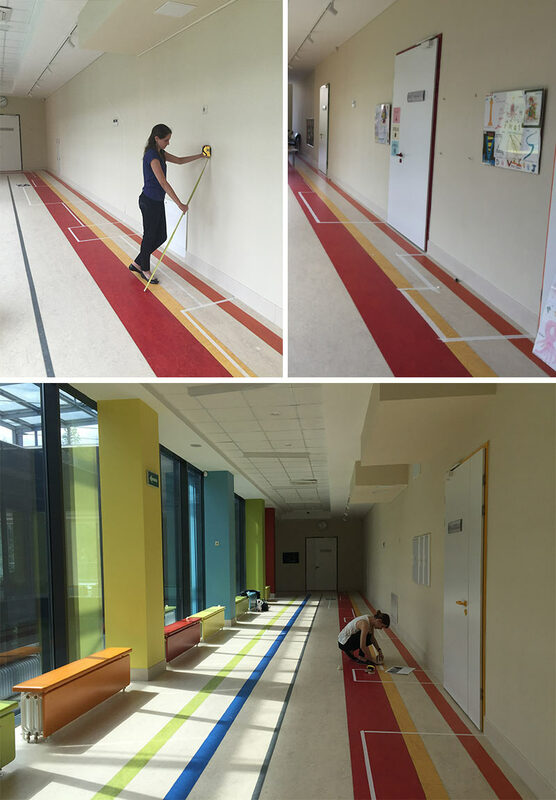 Using tape to estimate the position of the modules and see whether they clutter the hallway too much. Making small changes. 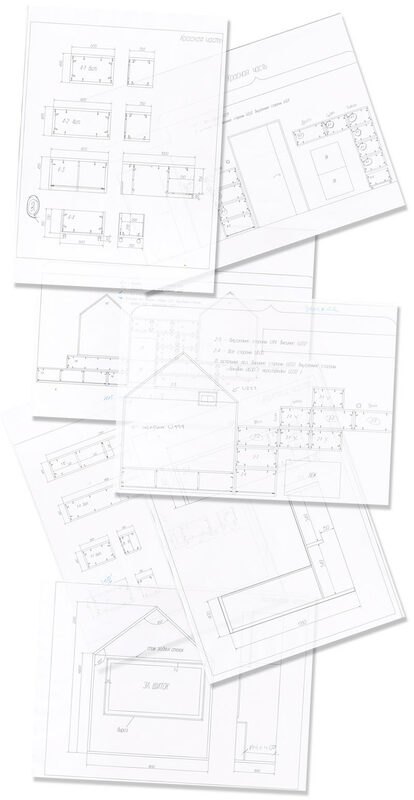 Preparing blueprints, ordering production of the furniture. At the same time the school’s foreman builds two upper levels and installs electrical wiring. The artistic director asks to create illustrations for the walls. Making the first sketches. Deciding to create small black and white drawings in line with the idea of the houses. Using outline and filling to make sure the pictures look coherent. Going with silhouettes for smaller illustrations. Supervising the construction of the upper levels. Choosing furniture and all the small details. Going to the furniture factory to check on the production of our shelves. Supervising the assembly. Personally testing each unit. Helping arrange the furniture, hang small elements, cut and glue Oracal illustrations.